Akin to Artificial Intelligence (AI), the concept and possibilities of deep learning are being contemplated and harnessed for several decades. But, in the recent times, the technology pertaining to algorithmic chips has improved considerably, promising to revolutionize major applications such as data centers to the simplest of microcontrollers. In the near future, as algorithms improve further to become more efficient in inferring and training, the market for deep leaning chipset is primed to flourish. According to this business intelligence publication, the demand in the global deep leaning chipset will multiply at a radically rapid CAGR of 24.7% during the forecast period of 2017 to 2025. The analysts of the report have estimated that the opportunities in the deep leaning chipset market, across the world, will collaborate to a revenue of US$1,264.78 mn by the end of 2025, swelling up substantially from its evaluated valuation of merely US$150.17 mn in 2015. The deep learning chipset market in current scenario is being led by graphics processing unit and central processing unit, but in the coming years, it is foreseen that there will be an extended role for other chipset types which includes application specific integrated circuit, field programmable gate array, and other emerging chipsets such as the Tensor Processing Unit (TPU). Deep learning models will actually be more of like programs, and will certainly have the capabilities to go far beyond the uninterrupted geometric transformation of the input data, which are currently being worked on. Deep Learning is expected to drive the AI adoption into various enterprises too. This report segments the deep learning chipset market on the basis of type, compute capacity, and end use industry. By type, the deep learning chipset market is categorized mainly into five categories, namely Graphics Processing Units (GPUs), Central Processing Units (CPUs), Application Specific Integrated Circuits (ASICs), Field Programmable Gate Arrays (FPGAs) and others. Due to complex algorithms and faster processor, the ASIC and FPGA segments are expected to witness strongest demands over the course of the forecast period. ASIC segment is projected to expand at an above-average CAGR of 25.5% during the aforementioned forecast period. Central processing unit (CPU) is the most known computer component responsible for understanding and executing most of the instructions from the computer devices hardware and software. However by 2025, graphics processing units (GPUs) would be the major chipset among others due its ability to perform together with the CPU for the purpose of deep learning, high end gaming, engineering application, and analytics. Based on compute capacity, the deep learning chipset market is bifurcated into Low (<1TFlops) and High (>1 TFlops). Based on end use industry, the market has been classified into consumer electronics, automotive, industrial, healthcare, and aerospace & defense. Geographically, the analysts of this report have evaluated the prospects of the deep learning chipset market in the regions of North America (U.S, Canada, Rest of North America), South America (Brazil and Rest of South America), Europe (Germany, U.K., France and Rest of Europe), Asia Pacific (China, India, Japan, South Korea and Rest of Asia Pacific), and Middle East & Africa (GCC, South Africa and Rest of Middle East & Africa). North America currently provides for the maximum demand, which is a reflection of mushrooming startups in the U.S. that are indulged in the R&D of artificial intelligence technology and developing applications supported by AI into the real world. However, the emerging economies of Japan, China, and India are expected to turn Asia Pacific into the leading region in terms of revenue. By 2025, the North America deep learning chipset market is estimated to be worth US$335.46 mn whereas the Asia Pacific deep learning chipset market will provide for a revenue of US$444.64 bn. NVIDIA Corporation and INTEL Corporation have been identified as two of the most prominent companies operating in the global deep learning chipset market, as of 2016. Global Deep Learning Chipset market report provides analysis for the period 2015 – 2025, wherein the period from 2017 to 2025 is the forecast and 2016 is the base year. The data for 2015 has been included as historical information. The Deep Learning Chipset report covers all the major types, computing capacity and end-users playing significant role in the global Deep Learning Chipset market’s growth over the forecast period. The report also include various drivers, restraints, and opportunities expected which affect market’s growth during the above mention period. The study provides an entire perspective on the market’s growth in terms of revenue in US$ Mn and volume in Mn units, across different geographical regions such as Asia Pacific, North America, Middle East & Africa, Europe, and South America. The market overview section of the report demonstrates the market dynamics such as the drivers, restraints, and opportunities that influence the current nature and future status of this market, key indicators and trends. An attractiveness analysis has also been provided for every segment in the report, in order to provide a detailed understanding of the overall scenario in the Deep Learning Chipset market. Moreover, the report provides an overview of various marketing strategies adopted by the key players present in the market. Key market indicators also been included in the report providing significance of the factors that are capable of changing the market scenario. These indicators are expected to define the market position during the forecast period. The report also highlights the competitive landscape of the global Deep Learning Chipset market, thereby positioning all the major players according to their presence in different regions of the world and recent key developments initiated by them in the market. The comprehensive global Deep Learning Chipset market estimates are the result of our in-depth secondary research, primary interviews, and in-house expert panel reviews. 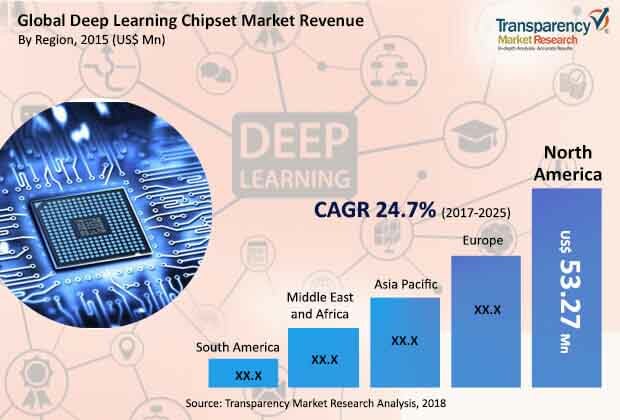 These market estimates have been analyzed by taking into account the impact of different political, social, economic, technological, and legal factors along with the current market dynamics that affect global Deep Learning Chipset market growth. This report provides all the essential information required to understand the key developments in the Deep Learning Chipset market, growth trend of each segment and companies strategies to efficiently compete into the market. Also, the report provides insights related to trends and its impact on the market. Global Deep Learning Chipset market is bifurcated by type, by Compute Capacity, by end-user and by region. By compute capacity, the market is further segmented into Graphics Processing Units (GPUs), Central Processing Units (CPUs), Application Specific Integrated Circuits (ASICs), Field Programmable Gate Arrays (FPGAs) and others. By Compute Capacity, Deep Learning Chipset can segmented into Low (<1TFlops) and High (>1 TFlops). By end-user, Deep Learning Chipset market is bifurcated as Consumer Electronics, Automotive, Industrial, Healthcare, Aerospace & Defense and Others. The prominent players in the Deep Learning Chipset market includes IBM Corporation, Graphcore Ltd, CEVA Inc., Advanced Micro Devices Inc., NVIDIA Corporation, Intel Corporation, XILINX Incorporated, TeraDeep Inc., Qualcomm Incorporated and Alphabet Inc.